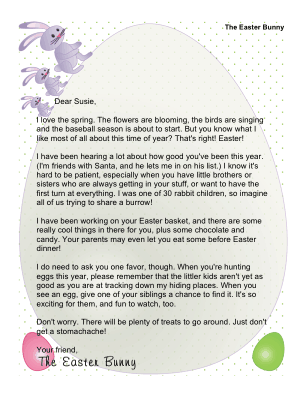 This printable letter from the Easter Bunny is intended for children with brothers or sisters, and urges the child to be patient and let little kids get some of the eggs, too. I love the spring. The flowers are blooming, the birds are singing and the baseball season is about to start. But you know what I like most of all about this time of year? That's right! Easter! I have been hearing a lot about how good you've been this year. (I'm friends with Santa, and he lets me in on his list.) I know it's hard to be patient, especially when you have little brothers or sisters who are always getting in your stuff, or want to have the first turn at everything. I was one of 30 rabbit children, so imagine all of us trying to share a burrow! 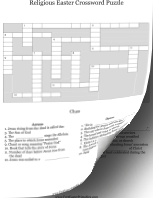 I have been working on your Easter basket, and there are some really cool things in there for you, plus some chocolate and candy. 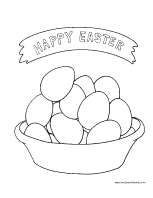 Your parents may even let you eat some before Easter dinner! I do need to ask you one favor, though. When you're hunting eggs this year, please remember that the littler kids aren't yet as good as you are at tracking down my hiding places. When you see an egg, give one of your siblings a chance to find it. It's so exciting for them, and fun to watch, too. Don't worry. There will be plenty of treats to go around. Just don't get a stomachache!